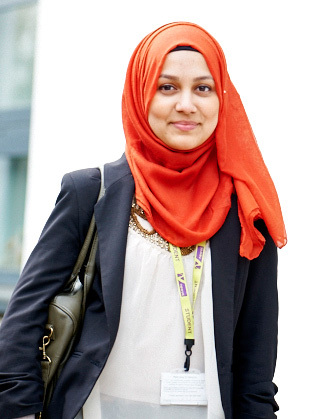 Rumana Ali, NewVIc class of 2014 and former Plashet school student. Achieved A-level grades A*A*A in History, English literature, Government and politics and an A in AS Economics and has progressed to study for a BA in History at St Hilda’s College, Oxford University. I now realise that achieving a place at Oxford or Cambridge isn’t the result of some sort of impossibly rare natural intelligence influenced by nothing but your genetic make-up. Very simply, and luckily more within your control, the process requires motivation, resilience and good old hard work. I arrived at NewVIc with dreams and ambitions like so many other students, but never thought it even remotely imaginable that I would be the student who left with an offer to study History at Oxford University. Something quite fascinating about the whole process is – you never quite think you’ve done enough until you actually achieve it. And as strange and contradictory as it may sound, being slightly cynical about yourself can have positive consequences, preventing you from becoming too comfortable and confident in your abilities. Complacency is possibly one of the biggest demons and to tackle it you must never be totally satisfied with yourself but always be searching for improvement. I had previously completed my GCSEs at Plashet School where, although I was reasonably academic, I was not the brightest pupil to say the least. Yes, I was ashamedly that ‘last-minute-revision’ sort of student that you would find panicking before entering the exam hall. In class I was occasionally cheeky and could even be disruptive. Unfortunately, like many others who have come before me, I didn’t realise the negative impact that this would have on my academic performance. My form tutor Ms Siviour, constantly reminded me that I had great potential and I regret not taking her advice more seriously. You see, hindsight is an amazing thing. It gives you a refined perspective – like looking through a mature and wise lens that you develop through time. As with everything, mistakes are only valuable if we bother to learn from them. And so, after starting at NewVIc I promised myself that I would adopt a different mind-set, one that was built around a disciplined, productive work ethic. I began to sharpen my focus during lessons and spend more time on independent study in the library when I could have been hanging out with my friends. It’s times like these, when you have to remind yourself how precious perseverance is, and that the sacrifices you make for your education will all be worth it in the end. It shouldn’t need a disastrous experience on results’ day to force you to come to that kind of recognition. I’m not afraid to admit that my dream to study at Oxbridge had its beginnings in Year 5 at Shaftesbury Primary School. Here, I was part of the school’s first ever Debating Society where our teacher Ms Sharpe, took us on trips to the Universities of Oxford and Cambridge to watch debates. I remember her saying to us: “I better see one of you lot studying here when you’re older!” In all honesty, it was only when I came to NewVIc that this vision became a possibility and not just a distant childhood dream. At college I was surrounded by teachers who genuinely cared and did everything in their powers to support me. Being part of the Honours Programme was helpful because it gave me the opportunities I needed to understand university life – through it I completed an Extended Project Qualification (EPQ) on the significance of Bob Dylan’s folk music in 1960s’ America, became involved with the UCL History summer school and even attended real-life Oxbridge seminars. Although still extremely demanding, my Oxford application (with its call for an aptitude test and the dreaded interview) was made a lot easier because of the encouragement and assistance I received from Carina, my History teacher and Honours programme manager at NewVIc. I am now preparing to leave London and continue my educational journey at Oxford. It will be strange and difficult to leave the city I’ve grown up and studied in, but it’s time to embrace this new phase of my life. I’m nervous, though more excited about what’s to come as an undergraduate student of History, whether that’s being taught by world-class professors or riding a bicycle wearing a gown. One thing is certain; there is a lot of work ahead. This entry was posted in Education, Guest blogs, NewVIc and tagged extended project, honours programme, Newham Sixth Form College, NewVIc, NewVIc alumni, Oxford university, Plashet school, Russell group, Shaftesbury primary school, St. Hilda's college Oxford, University College London (UCL), university progression. Bookmark the permalink.